It's resting on a chair. The others did not pan out. great photo, but how can you possibly relate this to " at rest "
Nicely composed and lit photo. Beautiful color. It's hard to understand what your intent was. I love the contrast of the vivid blossoms against the rich brown wood and black background. It really draws the eye. I also like the way the vase and the chair seem to meld together - It may have more drama with an alternatively colored vase though. The one issue I had with this is that the base seems to have a good focus and clarity but the flowers, which draw my attention have just a bit of fuzz to them, detracting a bit. I don't do still-life so I admit I'm going on gut reaction rather than technical savvy. Still, a very enjoyable photograph! 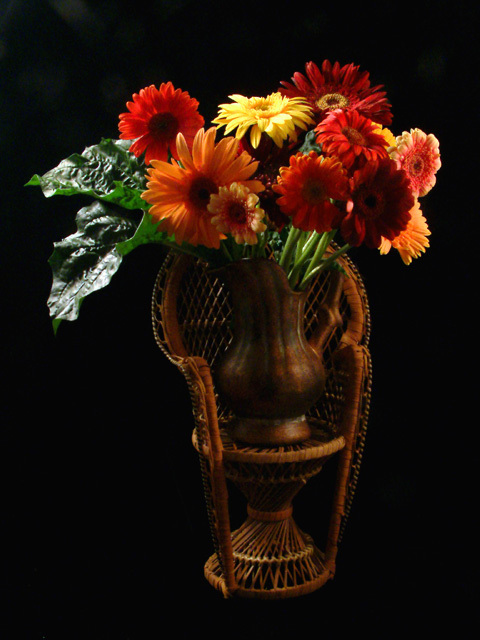 A seated Bouquet! I love the colors, excellent shot. Message edited by author 2003-10-07 16:33:19. Proudly hosted by Sargasso Networks. Current Server Time: 04/22/2019 11:58:40 AM EDT.